“Menorca was an island of pirates” Ramón Fritz, my guide and resident islander, begins. “A strategic gem in the Mediterranean Sea, with one of the deepest natural harbours in the world, it was under constant threat of attack”. He went on to explain how, for centuries, Menorca depended on an island-wide pathway, to spread news of approaching invaders. The Cami de Cavalls, or ‘Way of the Horses’, is a 186km bridleway that circumnavigates the island, passing through its key coastal towns, and was once studded with 11 lookout towers, between which, horse-riders would courier news of attack. 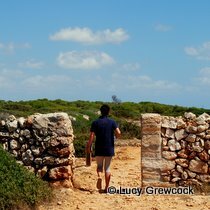 Islanders, like Raymond, consider this historic trail to be an important part of their culture and unique element of Menorcan identity but for the past 400 years, locals have been denied access to the trail where it passed through private land or had fallen into disrepair. 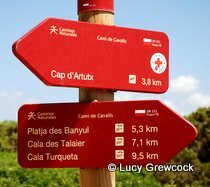 Today, after a decade of campaigning and restoration, the Cami de Cavalls has finally been reopened to the public and Menorca is now keen to encourage its visitors to share in the natural beauty and unique culture of the Balearic’s second largest island by setting either foot, tyre or hoof on the trail. It’s possible to tackle the full 186km trail by foot – a week long endeavour that will involve being shuttled to and from start/finish points along the track, (at present, it’s not possible to camp or stay directly on the route but there are plans to develop this aspect in the near future). However, a more popular option is to select one or two bite-sized sections of the route and to enjoy as part of a more relaxing holiday. To make things easy, the trail has been divided into 20 very manageable chunks, ranging from 6 to 13 km in length and varying in technical difficulty. With clear signposting throughout the entire route, following the trail is easy and it’s possible to pick up a section at any point on the island’s coastline; if you’re staying on or near the coast, you’ll never be more than half a kilometre or so from the pathway and the route even passes through the capital city of Mao and the former capital of Ciutadella. The tortured headlands and dramatic cliffs of the northern coastline offer some of the most challenging routes but make for breath-taking views and empty pathways. Of this section, the northwest is perhaps the most challenging, with narrow rocky pathways, near-vertical cliff faces and spectacular rugged vistas. The expansive beaches and smoother shores of the southern coastline, offer far easier walking in a dramatically different environment: expect gaping, flower-filled gorges and wide pathways. Following the footpath itself is easily achieved without a guide but to reach the wildest sections, avoid doubling-back on yourself and to enrich your experience with local insight, then a guide is essential and, in my experience, the times I spent with a guide far out-shone the sections I tackled alone. Raymond Fritz, of local walking company Rutas Menorca, had me exploring hidden caves along the southern coast; feeding sweet water turtles in his favourite section of the walk in the north; flinging rocks across the fields with a traditional Menorcan sling; and feasting on three types of Menorcan cheeses and four different meats at lunchtime. On another occasion, I joined Laura, of Viva Menorca, who recommended we take an evening stroll along a section that drops in on the secret beaches of the southern coast, inaccessible by car and not connected by roads: I discovered that the hidden coves, silicone sands and turquoise waters of Son Saura, Turqueta and Macarella will rival any Thai paradise. Despite a history of being dedicated to hooves, horse-riding around the entire Cami de Cavall trail is limited to the cooler months, leaving it largely to walkers and cyclists in the peak summer season. “Autumn and spring are far better times to visit, anyway” explained Sarah Barford, stable manager at Menorca a Cavall, “the weather’s cooler and the flowers are in bloom”. Instead, summer-riding takes place on a designated section between the northern beaches of Binnemela and Pregonda – one of the most breath-taking tracts of the island. I joined a group of 10 other riders one evening for an incredible sunset ride along the cliff-tops, a tricky canter through the pine trees and glorious gallop across the quiet beaches of this lesser-visited coastline. Novice riders gained just as much from the evening’s activities, as we stuck together as a group for much of the trail, with a group of us breaking off at intervals to tackle a more challenging diversion or let loose on open terrain; this ethos of welcoming all abilities is an attitude that Menorca a Cavall extend even to their week-long Cami de Cavalls experiences: “You don’t need to be an experienced rider, you just need to feel comfortable doing 6 hours in the saddle” Sarah told me, “…but if you’re an experienced rider who wants hard-core, we can do it!”. I had originally considered cycling to be a less arduous way of attacking the trail; I had imagined myself skimming along easy-going pathways with the salty-breeze in my hair, covering three times the distance I had by foot: I couldn’t have been more wrong. Cycling, or rather, mountain biking along the Cami de Cavalls isn’t for the faint hearted. The easiest sections are probably those found close to the resorts of Son Bou, Binnebequer and Punta Prima, in the south-east but, with small sections of these stretches ‘quite tricky’ and the coastline ‘less dramatic’, I was advised to head to the south-west coast, taking my lead from mountain bike champion-turned guide, Ruth Moll. Courtesy of her guiding company, Cavalls de Ferro (Iron Horse), I joined Ruth for a morning along the more forgiving southern sections; “this is some of the easier terrain” explained Ruth. But it seems, in Cavalls de Ferro speak, ‘easier’ means steering over thigh-high boulders, ricocheting down rock gardens, spinning my peddles through the sand and slipping off polished platforms. None-the-less, after a two hours gauntlet, I emerged triumphant, if a little bruised. This 15km taster was just about enough for me but, for experienced bikers, the Cavalls de Ferro presents a terrific new challenge; the ultimate achievement is to make it round the entire circuit in four days, for which Ruth will award you a revered Cavalls de Ferro t-shirt. For everyday cyclists who are up for a challenge, you’ll need to hire decent bikes and I’d certainly recommend chatting to Ruth before you embark. The best time to experience the trail is outside the peak summer months when the temperature’s cooler – far more comfortable than sweating away in August’s 30 degree heat like I did! Easyjet operate regular flights through the summer, and to visit outside this period, Monarch offers Saturday flights throughout the year. For dedicated Cami de Cavalls walking, cycling or horse-riding holidays, contact the respective companies below who will be able to assist with accommodation and transport, as well as guiding services. Lucy Grewcock is a freelance copywriter and journalist with over 10 years experience in adventure travel.